I haven't always completely understood what that line means. Certainly not at 10 years old. 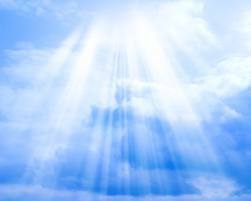 Is "heaven coming down" and "glory filling my soul" some kind of mystical, spiritual experience? The Bible teaches that the future is not an immaterial "paradise" but a new heaven and a new earth. In Revelation 21, we do not see human being taken out of the world into heaven, but rather heaven coming down and cleansing, renewing, and perfecting this material world...the biblical view of things is resurrection--not a future that is just a consolation for the life we never had, but a restoration of the life we always wanted. This means that every horrible thing that ever happened will not only be undone and repaired but in some way make the eventual glory and joy even greater...Everything sad is going to come untrue and it will somehow be greater for having once been broken and lost. Heaven coming down! I immediately started humming the hymn from my baptism. So heaven comes down when Christ comes again to restore the world back to its perfect, God-glorifying state. When he restores earth to the way it was supposed to be. The way God intended it. All the beauty, culture, colors, diversity of humans and nature intact, only without the scars, divisions, pain and suffering that goes with it. I'm not going anywhere. Heaven is coming to me. Wow. Then I got chills a second time because I immediately saw all those little children that were killed in that shooting massacre at Sandy Hook Elementary School a few weeks ago...ALIVE. I saw them back at their desks, their round, rosy cheeked faces smiling. A few were raising their hands eagerly, others wiggling in their plastic chairs. Their winter jackets hung on hooks by the door next to their lunch pails full of juice boxes and PB&J. I saw them HAPPY & ALIVE. Unhurt. Innocence restored. Peace resumed. They were back in the classroom, learning. Only this time, none of them had learning disabilities or glasses, or a stomach ache or ADHD. They were fully able to learn and filled with the joy that comes from learning something new with a clear, lucid mind un-muffled by early childhood traumas or physical malfunction. They were perfect little angels. There was no shooting, only shining. Jesus would hold every one of them. His glory would come down and cover them with an indescribable peace that could not be taken away. He would reunite them with their parents. I saw Moms and Dads running to this new classroom in Glorytown, grabbing their child out of their seats and hugging them so close neither would be able to breath easily and the complete, incredible joy of this reunion would be indescribable. The kids would wonder a bit what was going on, but the parents would know. What was taken has been returned. What was lost is now found. Things are as they are supposed to be. The parents' joy would be magnified by the loss they had experienced on that horrible day before heaven came down. But here, now, there was no loss, no regret, no sorrow, no what-ifs. Just joy, pure joy. That's what happens when heaven comes down and glory fills your soul. When God Went "Stephen King"